From elegant Danish watchmakers Skagen, this sleek ladies' watch is crafted with a classic yellow gold-plating. A matt case frames a brushed silver tone dial, simply detailed with glistening crystal hour markers. Finished with a slimline mesh bracelet, this timepiece offers the perfect balance of classic and contemporary styling. 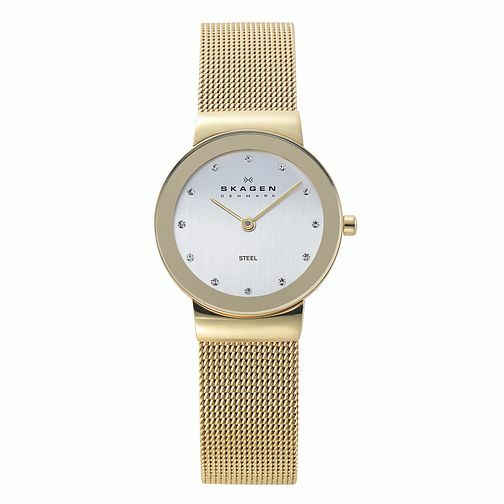 Skagen Klassik Ladies' Gold Tone Mesh Bracelet Watch is rated 5.0 out of 5 by 1. Rated 5 out of 5 by Anonymous from Gorgeous elegant watch Must have watch, light in the wrist and absolutely gorgeous.